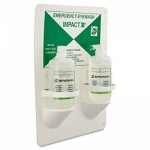 Durable, plastic station with two bottles of saline solution provides initial flushing for alkali and acid splash. Dated and safety-sealed to guard against contamination. Complies with ANSI Z358.1-1998 safety standard for personal eyewash stations. Includes one station and two 16 ounce bottles of solution.